George Osborne is of course entirely naïve in believing that a one penny cut in the price of a £3 pint will be passed on to the customers. How do you make a 1p cut to a commodity priced in 10p units? But expecting that level of reality from a Chancellor of Exchequer these days is perhaps far too much. Beer is so important here in Shropshire. Around 4,800 are employed in our 651 pubs, and many more in our 18 breweries. They underpin much of the tourist industry – not only by serving food and drink, but by providing a place where tourists can meet local people. Tourists chip in around £50 million a month to our local economy, supporting nearly 16,000 jobs. This is no small beer in a county with a population smaller than that of Southampton. We were in danger of pricing beer out of the pockets of both locals and tourists by the stupid beer escalator. The Labour government of old was unduly fond of such price and tax escalators, which generally take the form of retail price index plus a bit more. I have always regarded this as a rather odd fiscal mechanism because it simply creates a circularity that feeds itself. Costs go up, the RPI duly rises, and costs go up again as a result. It beats me why the coalition has decided to maintain this blunt policy (it applies to trains and water, for example). Fiscal escalators might be acceptable in times of plenty, but as the economy bounces in and out of recession the circularity begins to consume itself. If prices are raised when money and credit is scarce, people buy less. Businesses are undermined by struggling sales and rising costs. Tax revenues fall and welfare payments rise. People buy less, and the circularity spirals downwards. Now the beer escalator has been abolished. This will not save all our pubs – but it will give them a fighting chance. And that one penny a pint cut in duty will be added to the margins of the beer trade, strengthening its balance sheets. We’ll still be ripped off in some pubs. 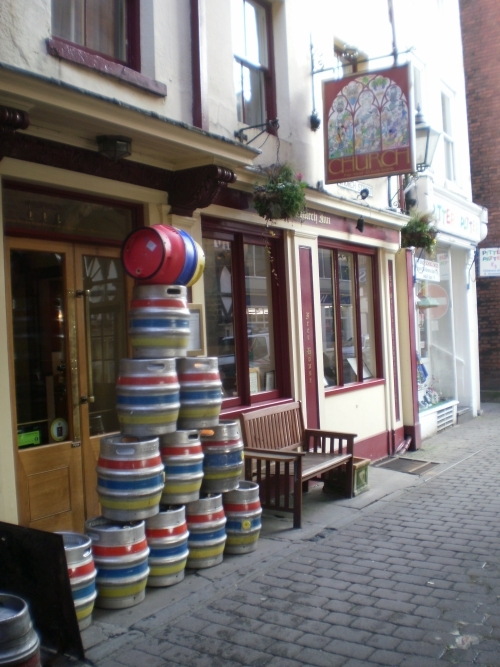 But if we chose a good local, selling great local food and fantastic Shropshire beer, we’ll not go far wrong. Now George Osborne and Danny Alexander. You have got beer duty right at last. Is there any chance of you fixing the economy so that we can celebrate with a pint or two? This text is partly based on my earlier article on Lib Dem Voice calling for the beer duty escalator to be scrapped. Next Post Can’t get into work? Why not clear Ludlow’s pavements of snow and ice?